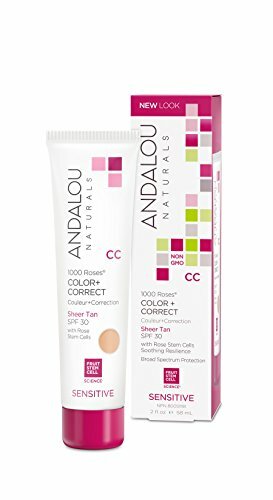 FOR SENSITIVE & DRY SKIN Hydration & sun protection in Sheer Tan, inspired by ingredients from nature & formulated for dry skin, delicate skin or easily irritated skin; rose & pomegranate help calm blemished skin & even your skin tone for a youthful look. 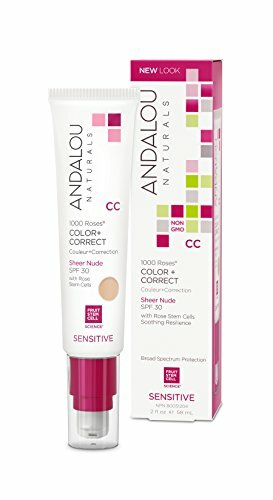 SENSITIVE & SOOTHING Andalou Naturals’ 1000 Roses skincare collection uses rose stem cells formulated for delicate, dry, sensitive and easily irritated skin. 1000 Roses line includes a foaming cleanser, day and night cream, toner, lotions & facial masks. Fruit stem cell complex and vitamin C are the stars of this multi-benefit balm providing broad spectrum protection with a natural, sheer mineral tint for flawless coverage in one easy step. ONE STEP moisturizing, lightly tinted and easy to wear SPF 30. VITAMIN C super antioxidants support skin’s vitality and complexion defense. FRUIT STEM CELL SCIENCE captures nature’s intelligence in every product. SOOTHING COMPLEX, a proprietary blend of skin calming goodness. POMEGRANATE ANTIOXIDANTS uplifting defense for youthful vitality. ALPINE ROSE STEM CELLS capture nature’s intelligence in every product.